I am writing this partly because of the oddity of what was on the map I was looking at and that it might be worth five minutes of your time. I was looking at Google maps and I came across a part that was divided off by an international border but wasn’t marked with a country name. It was surrounded by Armenia, Turkey, Azerbaijan, and Iran. So what country was it? My first thought was to zoom in, in case a country name popped into view, but it didn’t. 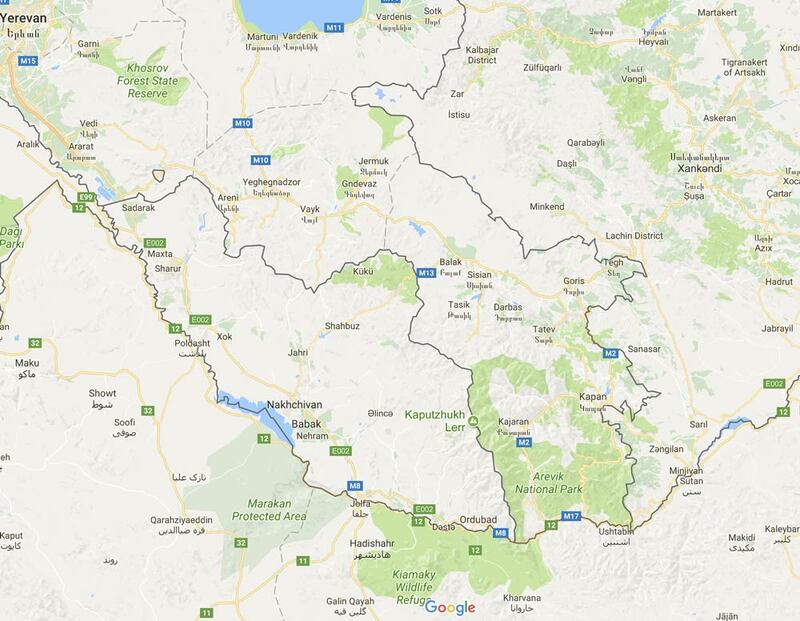 I googled the name of the largest town/city (Nakhchivan) and I found out the region is the Nakhchivan Autonomous Republic, an autonomous enclave of Azerbaijan. 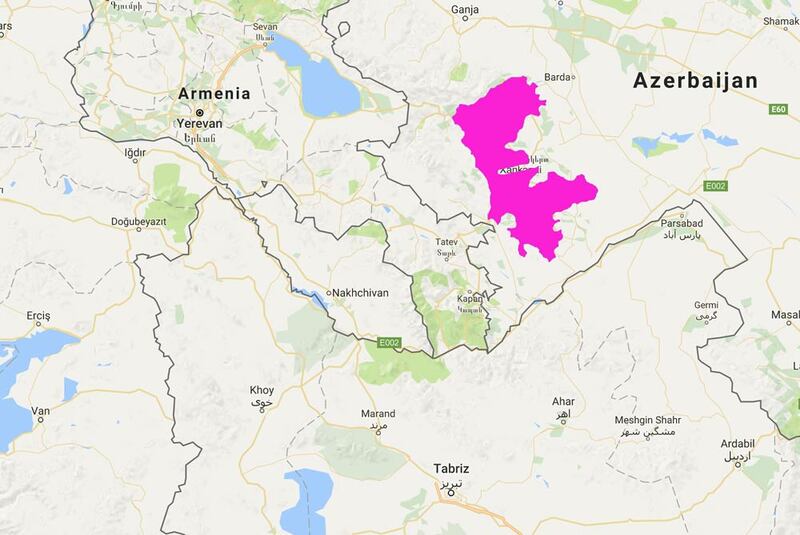 As you can see, it is separated from the rest of Azerbaijan and completely surrounded by other countries: hence it being an enclave. One thing – you may not be able to see it on this map, but it does share a tiny sliver of border with Turkey on the west. A bit more googling and I found out it was formerly owned by what was then Persia (now Iran) and then in the early 1800s after the Russian-Persian war, by Russia. That changed again with the 1917 Russian revolution when it was contested by Armenia and Azerbaijan. Fast forward to 1990 when it declared independence from the USSR to show solidarity with the nationalist movement in Azerbaijan, and the following year it declared itself the Nakhchivan Autonomous Republic within the newly independent Republic of Azerbaijan. 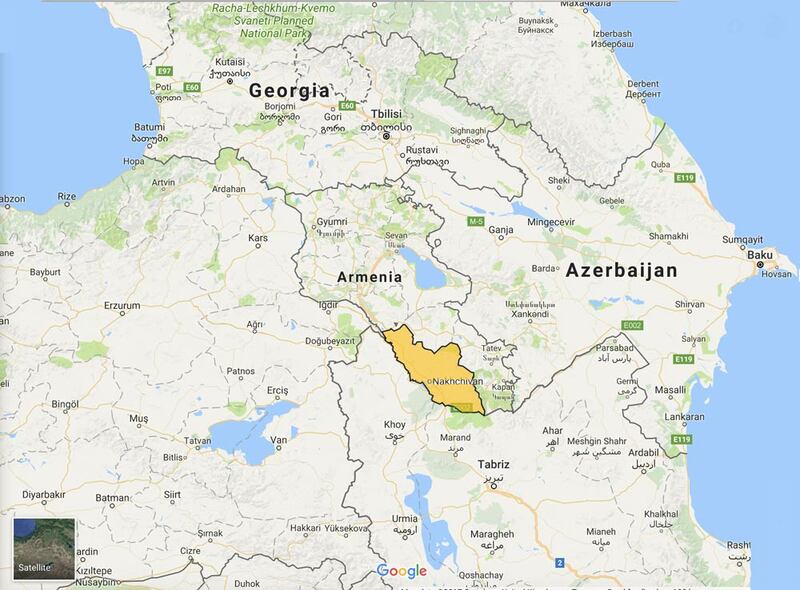 So it is an autonomous region of Azerbaijan. Now we know. That decision to ally with Azerbaijan resulted in conflicts and cross-conflicts with Armenia, Turkey, and Russia – who all had an interest in the outcome in terms of with which country the region would associate itself. So far so good. But reading about it led me on to the Nagorno-Karabakh War and Nagorno-Karabakh which is another region nearby. It is internationally recognised as being part of Azerbaijan but is run as an independent state by the Armenian ethnic majority. Not being a country, it isn’t marked on most maps and I have coloured it fuchsia on this Google map. Thanks for this, David. So many anomalies. Sounds almost like the Middle Yeast. I was thinking that as I was writing it. ‘Middle Yeast’: Is that an autocorrect typo or a ‘thing’? I like the concept! Full of foment and bubbling over with political confusion. I take it you don’t have an intent to travel there? Incredible how much we can discover with the wonderful web, if we have the time and patience, David. 🙂 🙂 Love your dahlia header too! Thank you about the flower. My Fuji surpasses itself sometimes. The thing is, I feel a sense of adventure in knowing the Earth. When I found the un-named bit, I had to know what it was. David, how bizarre, there I was last night looking at the map and this same area of the World. I spotted this same area and couldn’t fathom where or what it was. Tonight I was reading your most recent blog post and spotted with interest the other articles that led me here!